Questo appartamento in stile moderno con due camere da letto può ospitare comodamente un totale di sei persone. C'è un letto matrimoniale nella camera matrimoniale e un grande letto matrimoniale nella seconda camera. Nel soggiorno, c'è un divano letto matrimoniale. Se desideri cucinare nell'appartamento ci sono molti supermercati nelle vicinanze per comprare delle scorte o se scegli di mangiare in un ristorante, Saba e molti altri sono proprio dietro l'angolo. Il soggiorno ha una grande TV a schermo piatto con canali via cavo. Godrai della nostra connessione Hi-Speed ​​Wi-Fi in tutto l'appartamento. La cucina offre anche moderni elettrodomestici tra cui forno a microonde. Asse da stiro e ferro da stiro, lavastoviglie e lavatrice sono forniti anche. Questo fantastico appartamento con due camere da letto si trova nel cuore della zona più centrale di Dublino. Teatri, famose caffetterie, bar e ristoranti sono tutti dietro l'angolo. È a solo 1 minuto a piedi dal Trinity College (la principale università d'Irlanda), e Grafton Street (la principale area dello shopping) e Temple Bar (quartiere culturale) sono facilmente raggiungibili a piedi. Sarai facilmente in grado di camminare ovunque poiché questa è la posizione più centrale di Dublino. Very pleased with the location. The bathroom could use some hooks and a table plus some updating but it met the needs. Good kitchen and living area that we enjoyed. Bed rooms were good not great but for the value no complaints. The big complaint that I have really has nothing to do with the property or owner, it was the neighbors. Those neighbors were extremely loud and disturbing from 2 to 4 am for 2 of our 3 nights. The 3 best things was 1) the location 2) value for the money and 3) helpfulness of the management. We left an valuable article behind after we checked out and didn’t realize until a few hours later. The manager was great in working with us so we could return and reclaim the article. Location! Location! This property is in the hart of the City Center just blocks away from tons of restaurants, pubs, shopping, Temple Bar area, St. Stephens Green Park and museums. Apartment is nicely suited. Basics are provided (basic kitchen, hair dryer, iron and iron board). One bed is up the spiral stairs in loft area, one bed in own bedroom, and the last is the black convertible couch in the living room. It is a quiet apartment so great place to relax after meetings or a day of shopping. Note there is no lift and there are stairs to navigate to get to the apartment. 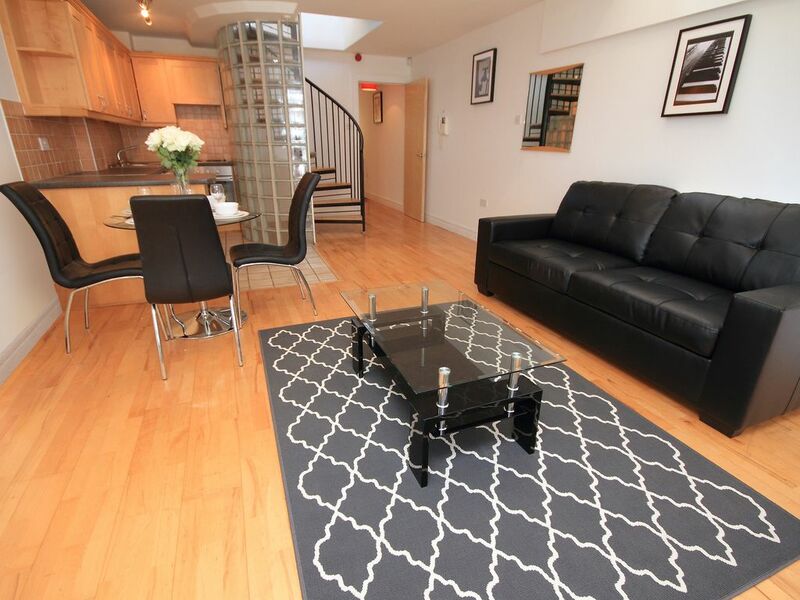 Great flat, great central location. Great flat In D2 surrounded by everything you want in a city (pubs, shops, restaurants and St. Stephens Green). Plenty of room for a family of four and has a clean open space. Perfect everything! I just couldn’t ask for a better vacation stay! The communication, the transportation, the hosts, and my entire vacation break went so straight and fast! I’m also planning to have the elegant interior designs of the apartment in my own house. The rooms are so big and clean. The bedroom has clean sheets, blankets, and pillows. The bathroom has a hot water readily available, and the kitchen has a wide cooking range with the fully working tools. Enjoyed here a lot! Would definitely recommend this!